(May 26, 2017) BROWNSVILLE, TEXAS - IBC Bank-Brownsville continues their support of higher education by awarding area students with the A.R. Sanchez, Sr. Memorial Scholarship and the Fred W. Rusteberg Scholarship as they venture into college and start a new chapter of their lives. Scholarships are granted to students who demonstrated a "Do More" attitude and leadership in student and community affairs throughout their years in high school. During the event, deserving students from 11 area high schools received $12,000 in scholarships. "Awarding the A.R. Sanchez, Sr. Memorial Scholarship is an important part of IBC's ‘We Do More' philosophy," said Al Villarreal, IBC Bank-Brownsville president and CEO. "The students receiving the scholarship are our future leaders and we are extremely honored to assist in the pursuit of their higher education goals." Born into a humble family, Antonio R. Sanchez, Sr., the namesake of the scholarship award and the founder of IBC Bank, was a strong supporter of making higher education available to those interested in bettering lives. Sanchez's commitment to the power of learning lives on in the A.R. Sanchez Scholarship Award, which is bestowed annually upon deserving high school seniors in South Texas and Oklahoma. The inaugural Fred W. Rusteberg Scholarship is in honor of banking veteran, community leader and founding president and CEO of IBC Bank-Brownsville, Fred Rusteberg. Rusteberg is a tireless proponent for developing Brownsville and its people. As an active member of the University of Texas-Rio Grande Valley Strategic Planning Committee and an instrumental board member of the University of Texas-Brownsville, Rusteberg encourages students to better themselves with high education. "It gives me great joy to know we are helping students with a scholarship which will defray the costs of going to college," said Villarreal. "We love giving back to our community and know the awards are appreciated." 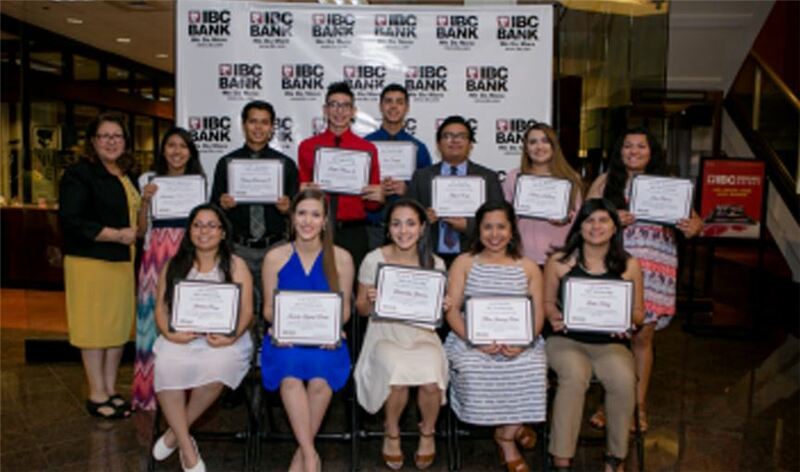 This year, IBC Bank-Brownsville handed out twelve $1,000 scholarships to students throughout the area. IBC Bank-Brownsville is a member of International Bancshares Corporation (NASDAQ: IBOC), an $12 billion multi-bank financial holding company headquartered in Laredo, Texas, with 192 facilities and more than 297 ATMs serving 87 communities in Texas and Oklahoma. In 2016, IBC celebrated its 50th anniversary since it opened its doors for business in 1966. IBC Bank's slogan "We Do More" reflects the bank's dedication to the growth and success of both the customers and the communities it serves. International Bancshares was ranked 46th on Forbes' prestigious list of 100 Best Banks in America in 2017. IBC Bank-Brownsville has been serving the area since 1984 and has a retail branch network of 12 locations. MEMBER FDIC / INTERNATIONAL BANCSHARES CORPORATION. Visit us on our YouTube channel, IBCBankWeDoMore. More information is available at ibc.com.